Androgen withdrawal is the only effective form of systemic therapy for men with advanced disease, producing symptomatic and/or objective response in 80% of patients. Unfortunately, androgen independent (AI) progression and death occurs within a few years in the majority of these cases (6). Prostate cancer is highly chemoresistant, with objective response rates of 10% and no demonstrated survival benefit (28). 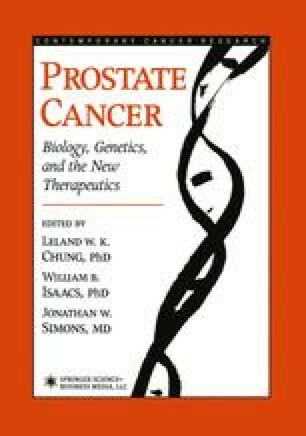 Hormone refractory prostate cancer (HRPC) is therefore the main obstacle to improving the survival and quality of life in patients with advanced disease, and novel therapeutic strategies that target the molecular basis of androgen and chemoresistance are required.